It has been eleven days since I've started my journey to Optimal Health with Take Shape For Life. Eleven days of eye opening experiences. Eleven days of newly learned or recently remembered tips. Eleven days closer to a new me. It's funny I actually took notes on my phone as the days passed so that I could share them here on my blog with you. I am all about sharing things that I've learned so that hopefully I can help somebody else who is on this journey with me! I've learned some really helpful coping strategies along the way. I have found that hands down, I am my weakest when I am at work. The shift I work has us eat two snacks and dinner with the girls I work with. The thing is, these meals are a nightmare when it comes to healthy living sometimes. So I've decided the best thing to do for myself is start bringing my own lean and green dinners to work. I also bring one extra snack to work so that if I feel like I'm going to fall into old habits of eating when stressed etc, then at least I will eat something that won't kick me entirely off program. In my purse at work I carry around pictures of me at a time in my life where I was comfortable with my body. This helps me to focus in on where I'm trying to go. Instagram has been one of my biggest helps. When I am feeling weak or looking for food ideas I search #tsfl, #takeshapeforlife, #leanandgreen. You get the idea. Also, I have started exercising before work and situations that I know will be tempting. That way I won't want to ruin the hard work I just did by cheating. On that note I must be honest, I did cheat a few times this week. It helped me realize some things. I get grumpy when I eat junk food. We are talking GRUUUUMMMPPY! I've noticed that the following day sometimes days it is harder for me to stay on plan because my cravings return. But once I've stayed on track for a couple days the cravings are so much more manageable. I have noticed my taste buds changing! I really want people to know that it's ok if we have bad days. What matters is that we pick ourselves up and keep on going. This journey is NOT about perfection, it is about progression. Making progress closer to optimal health and the people that we want to become. I'm sure you are wondering how I'm doing weight wise now that I've spilled my thoughts this week. I have lost a total of 13.6 pounds in 11 days. While eating a salad, dip the tip of your fork in the dressing then get a forkful of salad for your bite. You still get the flavor you want without eating as much dressing! "You can eat whatever you want, you just need to decide what you want the most." My amazing health coach said that one to somebody on our group support board. Wise words! 1. After making my family dinner (I do it daily now) my little guy looked at me and said, "Mommy, you are a superhero!" 2. One night while exercising after a cheat (I exercise to make up for my cheats), my son heard some noise and came to the living room to see what I was doing. He immediately asked to join in. So he exercised with me. My hubby told him it was time to go to bed and he said "I want to exercise with mommy!" He wants to do what I do. I need to make sure I'm doing and living the way that I'd want him to follow. You can see the picture of us exercising in the collage. 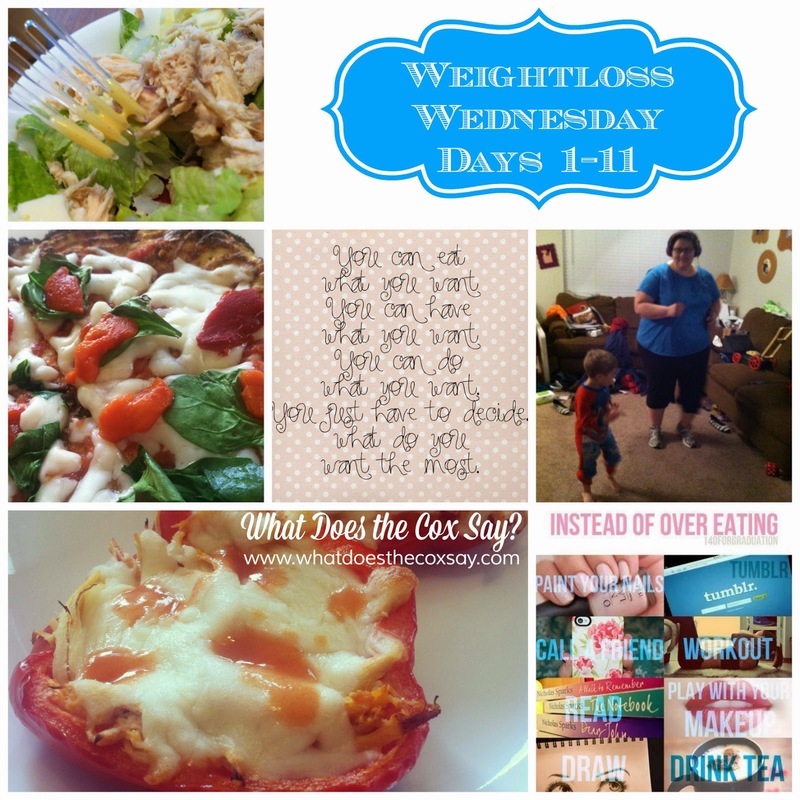 Stay tuned for next weeks Weightloss Wednesday! What are your favorite tips and tricks for staying on task with weight loss? You are doing amazing! I'm so excited to see all your hard work on the blog. Keep it up!!! You're doing great! keep up the work! I love reading your story!